Scatterhome is a settlement founded in 91 A.E. in an asteroid field located in the Starmourn sector. It is the “home of modern humanity” after the disappearance of the human homeworld, planet Earth that began the after earth era. Founded in the first century AE by Maddox Khan, it has gained notoriety within the starmourn sector as an asylum for criminals, as well as corporations seeking light regulation on their business activities. Along with its human inhabitants, it also houses a substantial number of Elgan, Krona, Bushraki, Jin, and other races. Only a fraction of asteroids in the field are inhabited to any extent, and most of the population is concentrated to half a dozen of the largest rocks fitted with powerful engines and set spinning to provide artificial gravity to the inhabitants. The population lives in tunnels, artificial caverns, deep canyons, and surface biodomes equipped with rad-shielding. The asteroids themselves are rich with minerals and chunks of ice, providing a near limitless supply of both water and metal to the inhabitants. 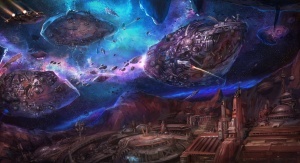 The remains of the Departed’s Worldship, the Blood Ark, are the living quarters for the Jin who came to the Starmourn Sector in the year 212 AE during the Second War of the Ishvana. Residents of Scatterhome benefit from the close proximity of a Voidgate. The most populous habitat of Scatterhome, Haven City is named after Maddox Khan's flagship, The Haven, and is the first rock on which he landed when settling Scatterhome. Over the centuries it has become heavily populated, and is now almost completely covered on all sides by huge structures. Commander Khan's famous words upon landing - "We're not taking off again." are engraved on a plaque in the center of the asteroid, and serve as Haven City's motto. Bodean is controlled by a number of Scatterhome corporations, their families, and their employees. Venture Chemicals, Ibix Manufacturing, Gravix LTD, Hercule Mining, and Amar Exports are some of the major corporations that call Bodean home and headquarters. Many of these conglomerations are family businesses, and the politics between the clans can be cutthroat. When Bodean was first discovered and spun up for habitation, deep wells were sunk into its surface with mining lasers, and these "reverse skyscrapers" are connected by an underground railway system known as the gravtrain. The wealthiest CEOs and land-owners on Bodean live in clear, rad-shielded domes on the surface. The private security firms that keep Scatterhome's population more-or-less safe (when the money's good enough, that is) are located in offices and garrisons beneath the surface of Marle, which is a mid-sized, mostly round asteroid. Such "security" ranges from the semi-professional, garrisoned outfits of Homewatch and Nebula Arms, to individual bruisers willing to serve as bodyguards for a day's pay and a hot meal. Proximity to the security firms has led some of Scatterhome's wealthiest to settle on Marle, where they live in rad-shielded domes on the surface. There is a sizable settlement of less privileged sorts who live beneath the surface, and serve the families aboveground in one capacity or another. Ishbi is used as a stockyard and moon-sized slaughterhouse, raising both oversized insectoid livestock and warm-blooded mammals in underground corrals and selling meat to the population of Scatterhome. The closest thing Scatterhome has to a garden world, Whittler's Hollow is, as the name suggests, completely hollow, and was claimed in the early days of the settlement by a young human engineer named Whittler, who immediately saw the potential of the rock. 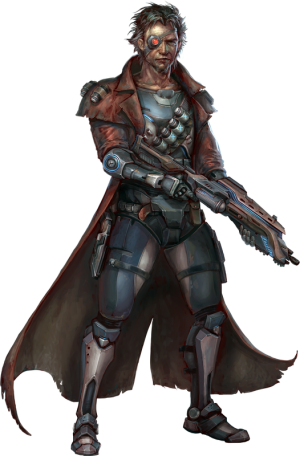 Working closely with the Elgan, with whom he struck a legendary deal, he expanded, reinforced, and terraformed the inside of the hollow asteroid. Trees and crops grow on the inside surface of the asteroid towards the nuclear-powered and levitating "sun" that shines at its heart. Much of Scatterhome's food is provided by Whittler's Hollow. The Blood Ark is the remnants of a large Jin worldship by the same name. After the Second War of the Ishvana ended, the Jin spacecraft was decommissioned after the enormous cost of its maintenance and repair was deemed too expensive. The ship was then powered down in the Scatterhome asteroid fields and sections of the Blood Ark were permanently decommissioned and slated for salvage. A large section is still designated for Jin who wished to remain on the Ark. This page was last modified on 22 April 2018, at 18:05.